Mix 120 g soft butter and 170 g sugar with 2 eggs. Add 350 g all purpose flour, 1 teaspoon baking soda and mix it again. Finally, add about 2 dl milk and mix it well. Coat a baking form with butter and flour. Pour the dough into the baking form. Bake it in a preheated oven on 180 ºC for about 35-40 minutes. Add 150 g icing sugar, 8 g cacao powder, a pinch of salt, a pinch of cinnamon and mix it. Add 10 ml creme fraiche, 100 ml kvark and some vanilla. Optionally, you can add some gelatine to make sure that the filling would not become too soft. In this case, just follow the instructions on the gelatine's package. before adding it to the filling. Finally mix well and cool it in the fridge for a couple of hours. Cut the cake into half to get 2 layers. Spread half of the filling on the first layer. Place the second layer on it and spread the rest of the filling over the top and the sides. 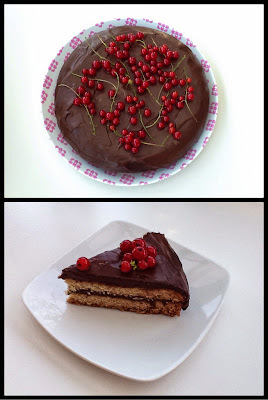 Before serving, place the cake in the fridge for a few ours (or an overnight). Decorate the top with fresh fruits, for example red currant. Again: mostly it turns to be a fantastic cake. But the filling sometimes becomes too soft and impossible to spread on the cake. It is not the end of the world, but you are about making a lovely trifle. Posted in Dessert. 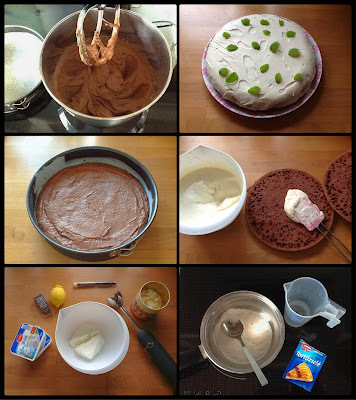 Tags: cacao, cake, creme fraiche, kvark on 03/07/2014 by Maagedeli. Add 350 g all purpose flour, 4 spoon cacao powder, 1 teaspoon baking soda and mix it again. Pour the dough into the form. Add 150 g icing sugar, a pinch of salt and mix it. Grate the skin of a lemon and add the zest. Optionally, you can add some gelatine to make sure that the filling would not become too soft. In this case, just follow the instructions on the gelatine's package before adding it to the filling. Before serving, place the cake in the fridge for a few ours (or an overnight). Decorate the top with melissa leaves. 9 out of 10 times it turns to be a fantastic cake. But every now and then, for some strange reason, the filling becomes too soft and it is impossible to spread on the cake. Then you have to accept the fact that you are about making a lovely trifle. Posted in Dessert. 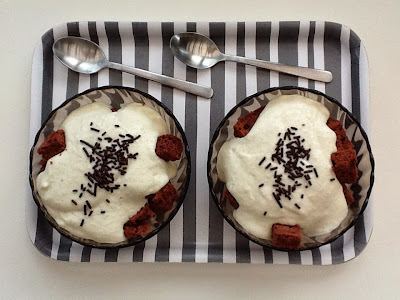 Tags: cacao, cake, creme fraiche, kvark on 02/07/2014 by Maagedeli.